Ramin Karimloo is playing Jean Valjean for a limited season in Les Miserables at the Queens Theatre and is due to leave the show on 3rd March. Geronimo Rauch, who is currently starring in the Spanish production of Les Miserables, will make his West End debut as Jean Valjean when the cast change takes place on 18th June 2012. He is contracted to play the role for a year to 14th June 2013. He will begin rehearsals in London on the 14th May and Rauch said: "I began my vocal teaching 17 years ago, listening to Colm Wilkinson singing as Jean Valjean, I can´t believe that I´ve been given this chance. I never imagined then that today I´d take this role." 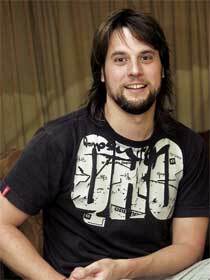 Geronimo Rauch was born in Argentina in 1978 and reached popularity in his native country after winning the reality show PopStars in 2002 when he became a member of the hugely successful pop group Mambru. His debut in musical theatre was in the Argentinean production of Les Miserables. He has played the role of Doody in Grease and starred in Jesus Christ Superstar and Chicago also in Argentina. He was then selected to lead the Spanish production of Les Miserables as Jean Valjean. I saw Les Miserables on 29th June for the third time. This time was incredible and Geronimo, in particular, excelled. I can recommend the production to anyone, even those who have seen it before. Couldn't agree more. I was a bit lukewarm about Geronimo being cast (for no reason other than I didn't know his work) but went on his opening night and was blown away!